This is one of two dishes I prepared to participate in Foodalogue’s Culinary Tour, this time visiting my stomping grounds, Panama! This dish came to be as a result of a ‘What’s in the Bag‘ challenge posed by my dear Hubbz. He went to the store and brought everything but the butcher’s block, which I then had to incorporate into a Latin meal. 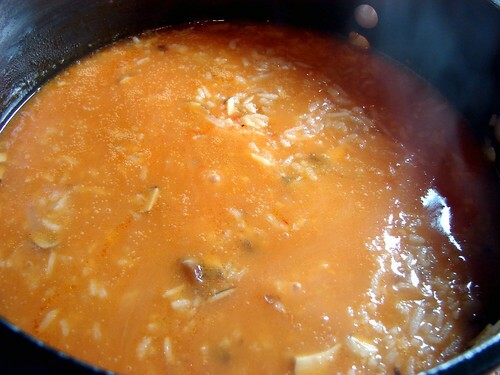 Guacho (pronounced Wah-cho) is a popular Panamanian specialty; a slightly soupy rice dish, similar to an Italian risotto or a Puerto rican asopao. 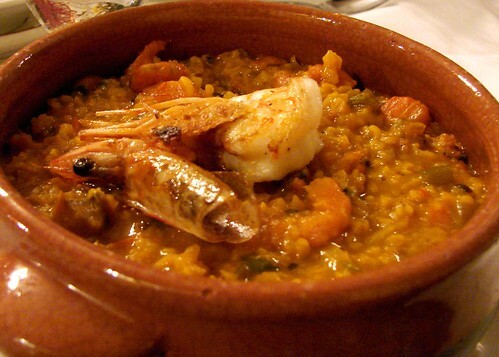 Unlike risotto, guacho is made from regular, long grain white rice that is soaked in water for a bit before it is sautéed and simmered in the cooking liquid of choice. The dish is then flavored and augmented with an array of local ingredients; there’s always some sort of meat or protein from pork, chicken, cured pig’s tails, or seafood, in addition to various beans and roots such as yuca and otoe. Different from the way I’ve usually explained how to cook rice, the rice in guacho wants for more liquid and a longer cooking time, this allows for the rice starches to develop into a creamy, rich frenzy. I pretty much stuck to the traditional elements of the dish, only straying away in the preparation of the sofrito and by adding mushrooms to the rice itself. Panamanian sofrito is generally made with onions, bell peppers, tomatoes, garlic and a few other aromatics, this time I included dried chile ancho and guajillos. But enough chatter, let’s cook! In a medium pan heat the oil and add the onions, cook them until soften before adding the garlic and green onions. Then add the tomatoes, 1/2 cp water and chile puree, lower the temperature and allow it to simmer for about 20 minutes. Keep warm. For the seafood broth: I used the skins from the shrimp, bringing them to a simmer with plenty of water, 1 clove garlic, one of the dry ancho chilies, cilantro (culantro, if you can find it), 1 carrot, salt & pepper. Strain and set aside. 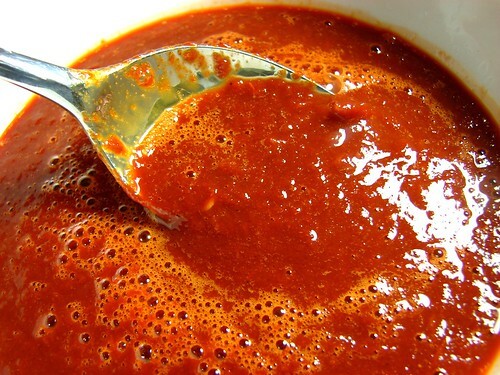 For the chile puree: Rinse and seed the chilies–remember Panamanian food is not typically spicy hot. Put 2 ancho and 1 guajillo chilies in a small pot with 2 cps water, 1 clove garlic, a pinch of salt and simmer for about 10 minutes until the chilies soften. Allow it to cool before running it through the blender. Set aside. 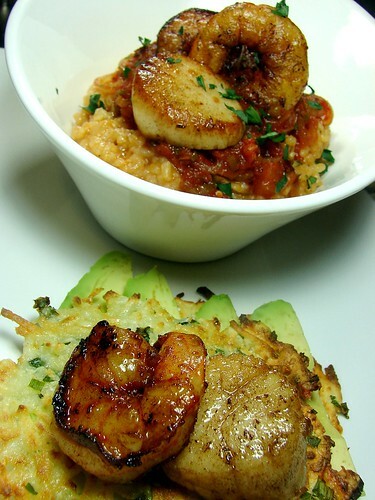 For plating: Reserve a few shrimp and scallops to place over the finished dish. Rinse the rice, then add enough cool water to cover it and allow it to soak for at least 20 minutes and up to 1 hour. 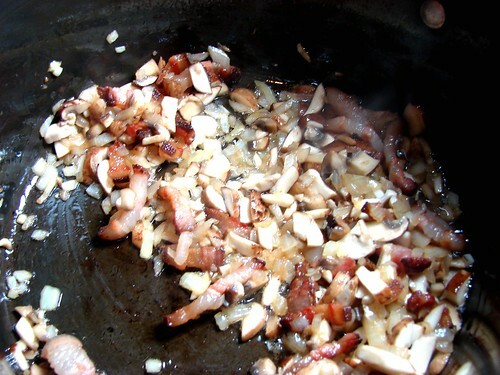 In a large pan, render the fat from the bacon, but don’t crisp it. 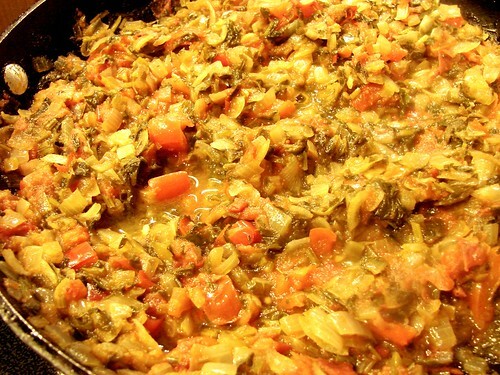 Add the onions and allow to cook until they begin to soften. Then add the mushrooms and cook for about 3 minutes. Drain the rice and add to the pan. If necessary, add a bit more olive oil, just enough to coat all the grains. Add 2 tbsps of the chile puree, 6 cps of the seafood broth and adjust the seasoning by adding sea salt as necessary. Lower the temperature to medium-low and allow it to simmer until the broth evaporates. Stir it every so often to make sure nothing gets stuck to the bottom of the pan. While the rice is cooking, prepare the seafood: chop the shrimp and scallops to bite sizes (remember to save a few of each for plating). Marinate all the seafood (including those for plating) with 2 tbsps of the chile puree and a bit of sea salt and black pepper; set aside until needed. Once the broth has evaporated, check the doneness of the rice grains. They should be fully open and swollen. If the liquid has evaporated completely, add a bit more broth or water, then add the chopped seafood. Stir in the seafood, bring the temperature to low and allowing to cook covered for another 5 minutes. In the meantime, saute the reserved shrimp in a bit of olive oil, set aside. 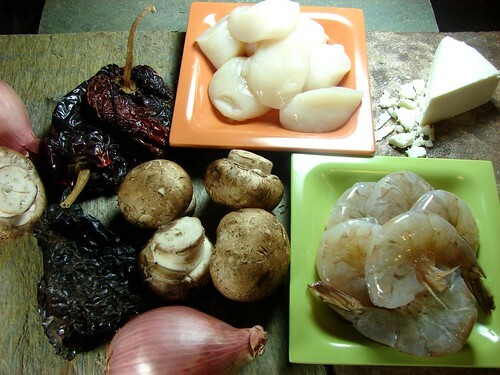 When ready to serve, spoon some guacho on the bottom of a bowl, top generously with a couple tbsps of sofrito and top with the sautéed seafood. Enjoy and Buen Provecho! For the rest of the yummy guacho shots, follow this link. You can also see the other dish, Langostinos en Caramelo de Maracuyá (Prawns in Passion Fruit Caramel) by following this link. And don’t miss the entries submitted by other food bloggers, visit Foodalogue for the tasty bits. Another fabulous looking dish that shows I didn't research the country's cuisine well enough. There is much to be offered in Panama. 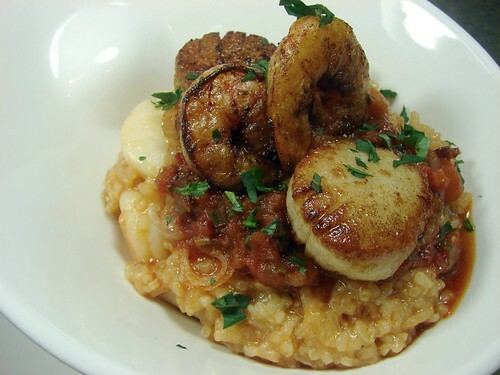 I read the recipe throughly and am impressed by the levels of flavor that you continually added -- and I'm glad you reserved a few scallops + shrimp to top the dish because they are caramelized beautifully. Thanks Anamaris. Another winner. I am with Joni, I also did not do enough research... The rice loos so creamy and that scallop...just the way I like it. Increible! Oh my gosh girl I would love a dish of this right now! And I don't even have to tell about your fabulous photos right? I'm drooling, probably will be dreaming about this one too! I so enjoy Joan's tours, brilliant and oh so yummy! You're always so kind, Cindy. Truth is I intentionally make you drool. How else would I keep you coming back for more? My friend who is living in Panama said the food is 'uninspiring'. She hasn't been in your kitchen. Lovely post - so informative. @Sally-I'm sorry to hear your friend's food experience hasn't been enjoyable. I'm curious to know where in Panama she is living. I was born and raised in Panama City until age 23 and I can tell you that almost every cuisine of the world is represented there. However, if she's living in one of the provinces, international variety may be scarce to non-existent depending on the province. Traditional Panamanian cuisine isn't fancy or refined, but there is a current movement towards that end of the spectrum and many chefs are banging it out. That said, I wouldn't describe the local food (by province) as 'uninspired', maybe rustic and unassuming, but it too can be quite varied. There are some ever present ingredients: rice, root vegetables, seafood, pork and yellow corn and a lot of the food may be fried or stewed. Even then, there are so many variations in how one single ingredient is used, that even I haven't tried them all, not even after frequent visits back home. I can offer some suggestions on eating establishments and even dishes for your friend to try, feel free to email me at chefityourself @ att (dot) net or you can pass along the email to your friend and I'll help. I can also give her a list of local cookbooks for her to try, if she's a cook. Everything looks so delectable. It has been so much fun to travel to Panama. This looks so incredible! I love all the layers of flavor that go into the dish. Wow. That's just amazing. I already veganized it in my head using palm hearts instead of scallops....yumie! This looks absolutely incredible... makes me want to buy a plane ticket to Panama. 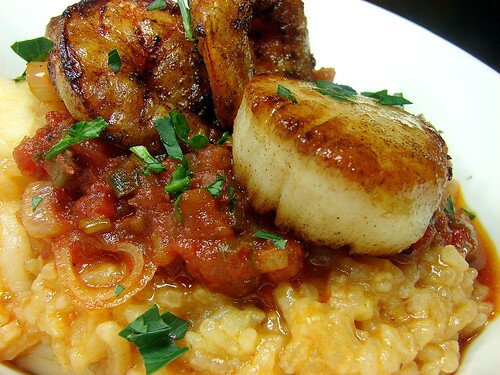 Caramelized scallops and warm, delicious rice. Right... trying not to drool on the keyboard. Hola! Todo se ve súper delicioso! :D Voy a ver si pruebo la receta este finde. Un beso y gracias por el post. From a Panamanian cook to another, I'm glad our culinary culture is finally reaching out to the world thanks to you and so many other chefs. :D I definitely adore the fact that many people from around the world are interested and impressed by our cuisine. I'll borrow your recipe for today (sans scallops), as there's seafood on today's menu at home. Cheers, and thanks!